Washington (AFP) - Repair work on the dome of the Capitol building began Tuesday, as workers started fixing hundreds of cracks on the rusting 148-year-old structure, home to the US Congress. 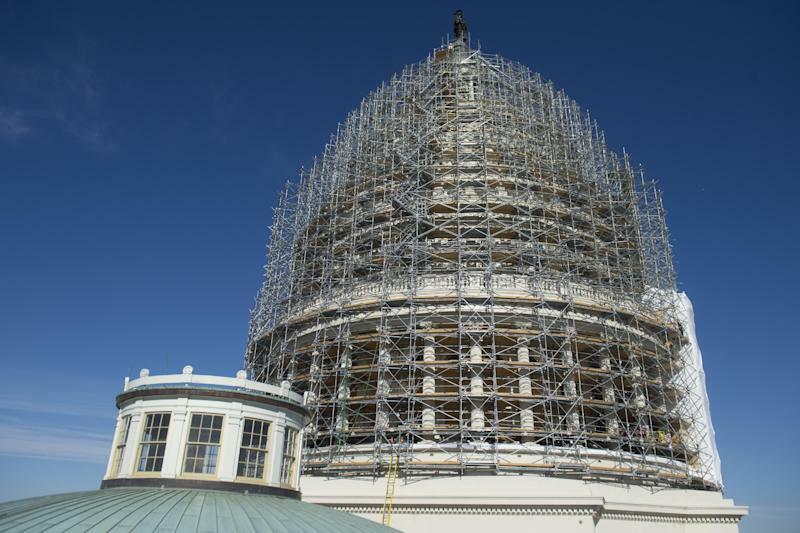 Crews have completed the metal scaffolding that now encases the dome and work has begun to repair some 1,300 cracks, said Architect of the Capitol Stephen Ayers. "This is a significant milestone for us in our dome restoration project," Ayers told reporters. The rotunda is made of cast-iron girders, plates, columns and ornaments, and more than five decades after its last restoration, the cast-iron plates are now rusting. To complete the facelift, workers will blast 14 layers of lead-based paint off the dome and use a "metal stitching" process to fix the cracks before repainting it. Construction will cost about $60 million and will take around one year to complete, Ayers said, adding that the repairs should last for up to 100 years. The last time the civil-war era dome was restored was in 1959-1960. The building in the heart of the US capital Washington will remain open to the public during construction. The metal scaffolding cocooning the dome is illuminated by 720 LED lights to aid the repair work, and create a dazzling, pixilated effect on the building. The Capitol's first dome, a smaller wood-and-copper structure completed in 1824, was deemed a fire hazard in the 1850s, prompting construction of the modern version that required less upkeep.